﻿ Riad Meski Fes. JIMAT di Agoda.com! Ada soalan mengenai Riad Meski? Riad Meski, terletak di Fes El Bali, Fes, merupakan satu pilihan popular bagi para pelawat. Dari sini, tetamu boleh menikmati semua kemudahan yang bandar ini tawarkan. Dengan lokasi yang mudah, hotel ini memberikan akses mudah ke tempat yang anda perlu lawati di bandar. Ambil kesempatan daripada pelbagai perkhidmatan dan kemudahan yang tiada tandingan di hotel Fes. Tetamu boleh menikmati kemudahan seperti khidmat bilik 24 jam, Wi-Fi di tempat awam, khidmat bilik, pengangkutan lapangan terbang, bilik keluarga. Alami bilik dengan kemudahan berkualiti tinggi sepanjang anda menginap di sini. Sebahagian bilik menyediakan karpet, teh percuma, cermin, tuala, almari untuk memudahkan tetamu berehat dan kembali bertenaga. Kemudahan rekreasi hotel, yang termasuk seperti rumah urut direka untuk anda melarikan diri dari masalah dan bersantai. Riad Meski merupakan tempat yang ideal bagi penginapan pelancong yang mencari keindahan, keselesaan dan kemudahan di Fes. We found the Médina of Fes very confusing to navigate. We were never able to get comfortable navigating around. The staff at the Riad, however, were very helpful and accommodating. They took very good care of us during our stay. For that reason I can gladly recommend this guest house to anyone. It was a good value and we felt very safe. We had a lovely stay in this riad. We were greeted with delicious mint tea by Ahmed who was a lovely host. We came as a couple but as the family room was unoccupied Ahmed upgraded our room for a few days which was very nice. When we moved to the standard room it was obviously smaller but still clean and cosy. We ate a few nights in the riad, Ahmed’s mother is the chef, and the food was delicious, and the breakfast was also good, with fresh orange juice and nice coffee. The location of the riad is good, we decided to get an airport pickup as we arrived at night, and we were met at the gate by friendly Mohammed. By the end of our stay we were able to navigate ourselves from the riad into the centre of the medina, or the gate. The riad has good WiFi and a nice roof terrace. We would stay here again. The house is near the monuments. There are 3 houses and ours did not look like the picutres (it was much easier without fontane etc.) but the rooms are very clean and the friendly, helpful staff (especially the housekeeper) let you forget this. We arrived very early in the morning. No room was ready by then but we could keep our bags there first and we went out to explore. The whole riad is fantastic. The only thing we would like to pinpoint is the drainage in shower room was clogged. Big room, old and beautiful riad, good breakfast. Did not enjoy it, the room was cold and very small bathroom. I would have expected more for a rating of above 8. The neighborhood is deserted at night with only locals around if any. I choose to stay indoors in the riad at night because I did not want to get lost in the alleyways especially when hardly anybody is around. Getting lost would mean I would have to engage those unsavoury hustlers to show me my riad. I enjoyed my stay a lot. Great ambiance and wonderful hospitality. Traditional Moroccan dinner was fantastic. I will come again. Our hotel is very old, more than 400 years old. It gave us the feeling and experience back to old times. We enjoyed the truly Moroccan interior design. We are glad that we made pick/drop up arrangement because it is difficult to find hotel as if we are in MAZE. Bus station, train station and airport is far from old town Fes (it takes 30 min to 45 min by driving). Hotel staffs (family) are very friendly and help us when needed. Homecooking breakfast were awesome that you ever experience. This is an amazing little Riad and Ahmed and especially Mehdi are very good. They were helpful throughout and were able to take us to local Hammam and within a couple of days we were able to navigate our way around most parts with their help! The Riad is very close to Bab Guissa so taxis nearby to take you to New Fes (McDonalds, Pizza Hut etc) at will and very cheap. Best of all was the food, it truly was amazing. I wouldn't hesitate to recommend this to anybody and everybody. Thank you Riad Meski, Ahmed & Mehdi! I like the decorations of this house. My friend and I stayed for two nights. The owner Saida was friendly, we talked a lots. As we got sick, she even made a drink with herbs for us to feel better. Great location. Excellent generous breakfast . Friendly and helpful. truly a fabulous place to stay in the old medina in FES. 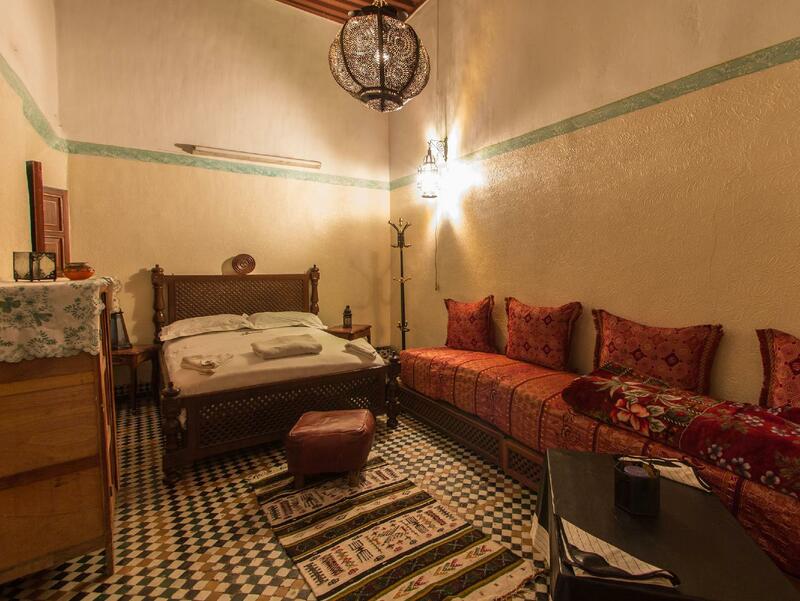 also a bit hard to find but do calll before hand to arrange for someone to bring you to the riad. a welcoming experience in a beautifully refurbished building wherre old the old moroccan element were kept. tastefully furnished in all area. the terrace has a nice view and the ownwer can help to cook your meals if u do not wish to venture out in the night. tours and guides can be arranged thru the riad. and its a true moroccan hospitality u wont forget. We spend two nights in this beautiful moroccan hotel. The room was very comfortable, the bathroom was clean. Breakfast was included and delicious. You can have Breakfast on the terrace with a wonderful view about the Medina. The service is excellent, They helped us a lot to get a good orientation. It is very familiar athmosphere and you feel like home. The price/ performance ratio for this is absolutely correct. If i come back to fes i would go to this hotel again. The riad is hard to find at first but its in a good location. 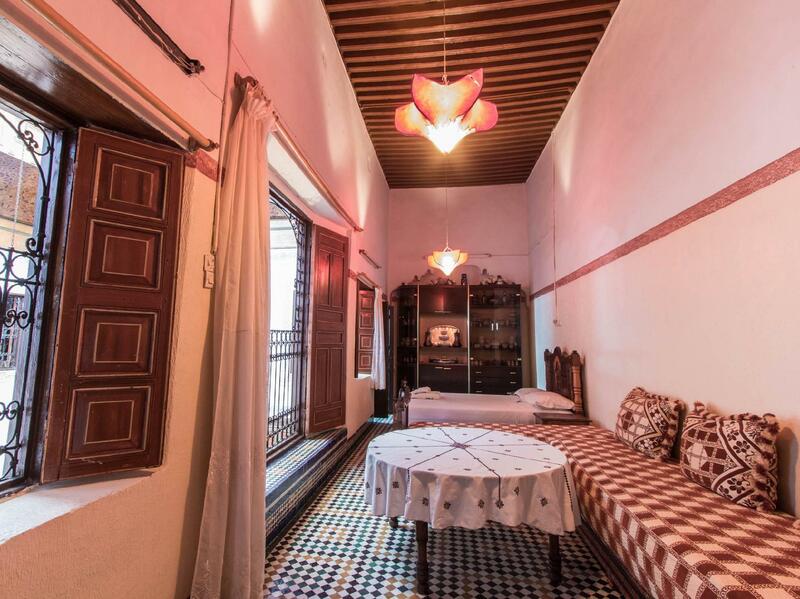 You need a guide to find the riad the first time and it may be tricky to find it again after exploring the riad on your own. Find a map of the medina and dont trust most locals to help you find the way back to the riad. They will try to trick you and direct toward their shops or restaurants. 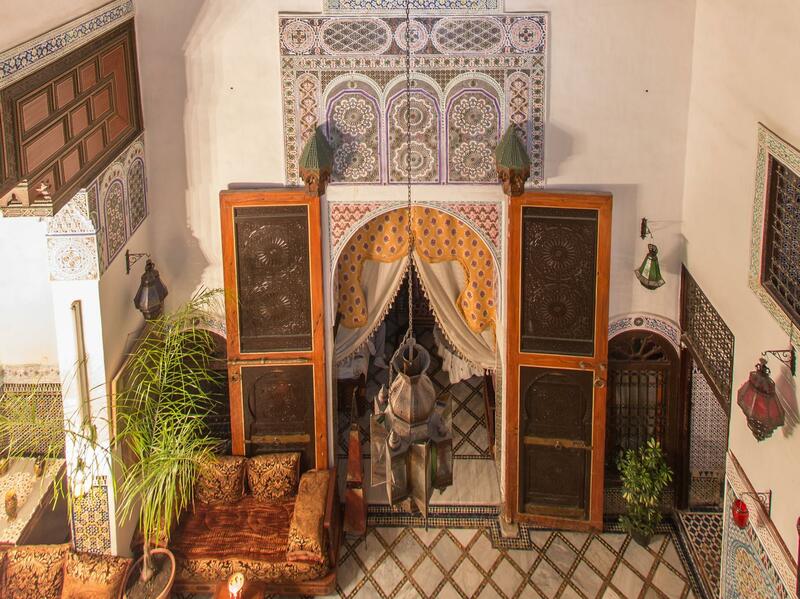 Overall, the riad is an amazing place with traditional and incredible decorations. The rooms are big and full of wonderful Moroccan decor. The daily free breakfast is fantastic but beware of ordering the homestyle dinner. Its 5 times the price of the same food to be found outside in restaurants. The setup of the rooms makes it able to be able to hear all the noise from other guests and the host family upstairs. There was a screaming baby that was crying very often. However, the family was very helpful and nice and made our stay very enjoyable. Check this place out, we had a great time. I had an amazing stay. It's decorated in an amazing Moroccan style. The breakfast is the best I've had in Morocco. And the family who run it are as helpful as can possibly be. I 100% recommend staying here. We returned to Riad Meski for an overnight before goin on a desert tour organised through the Riad. We returned because of the homeliness and helpfulness of the staff! When we arrived in Fes we were picked up at the airport (pre-arranged) by a very knowledgable driver and made us feel very welcome. We were taken right to the door step of the medina. Highly recommend this if its your first trip into the medina. Ahmed greeted us and made us feel at home instantly. The riad is well located a little out of the main area which was actually very nice. A very complete and tasty breakfast was served every morning. Te fresh orange juice is amazing. All in all a very enjoyable 4 nights with the Meski family.